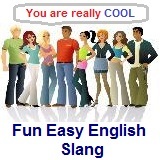 ﻿ Fun Easy English - new american english slang letter i. In this lesson you will learn American English slang beginning with the letter I. You will learn the definition and study the usage of each slang. icky unpleasant The food at this restaurant is really icky. I.D. identification Can you show me some I.D. please? idiot box television set He always sits in front of the idiot box and never gets any work done. in fashionable The tie you are wearing is really in. intense serious This is a very intense situation we are discussing. ivories teeth She has really beautiful ivories. Hey do you know any English slang beginning with the letter I not listed on this page?